The best way to create miracles in your life is to expect them with every fibre of your being. Seek them out with all of your senses. Look for signs of their imminent arrival in every aspect of your life. When you meet someone new, keep your heart and mind open, wondering if they could be bringing with them a new opportunity for you to share your gifts. Know that you sharing your gifts could be the answer to their prayers. The joy of giving is just as important to our Souls as the joy of receiving and this reciprocal sharing of energies can be just what you need in order to get you to the next level. Miracles come in many forms. They may be physical or they may be energetic. A miracle could be a healing which did not seem possible; it could be an opportunity that comes seemingly out of nowhere; it could be a material object that you have been desiring for quite some time; or an adventure or experience you never thought you would be able to participate in; it could be Love, passion or romance walking into your life when you least expect it; or it could be sun shining brightly despite the forecast saying it is supposed to rain. Appreciate the small miracles and know that bigger ones will follow. 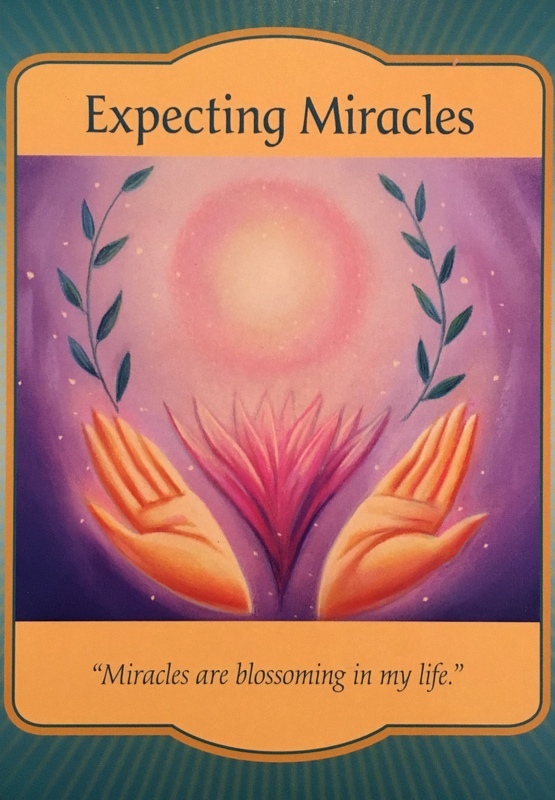 Affirm to the Universe that you notice the abundance of miracles that surround you at all times, and experience miracles surround you at all times. Fill your heart with love, light and gratitude for the biggest miracle you know; your existence, right here, right now, in this lifetime. Learning your lessons, experiencing all the world has to offer, discovering your talents and sharing them with others. Know that this is the true meaning of miracle, to experience life in the physical… even though it may seem challenging at times. Remember, that is why you keep choosing to come back here. The miracles get you every time.